Here is a how to lesson, on how to upload video captures from your MSNTV Plus Box to a web page, it is quite easy & fun ! Note: MSNTV users, use this link below to sign up for Eudora. Now send a video capture to your new EudoraMail email account from your MSNTV account. Go to EudoraMail and "Log On" to your account. Click on the email in EudoraMail that you just sent there from your MSNTV account. Now click on the the "Download" button. The 6th button from the left. (Note: when you get a popup stating a frame can not be loaded just click and close the popup and continue on). Next click on the "Snapshot" link. Now click on the "GoTo" button on your MSNTV keyboard, then in the popup click on the "Show Last" button. You will see a long URL, hold down The CMD key, then hit the "A" key to highlight the picture's long URL. Once the URL is highlighted hold down the CMD and hit the "C" key. This will copy the URL to the clipboard. Now go to a Transloader. Put the cursor into the box beside "Source URL" in the Transloader form. Delete the http:// that is present. The http:// will be pasted with your picture's URL from EudoraMail. Now you Hold down CMD and then hit the "V" key. This will paste the picture's URL that you copied from EudoraMail into that "Source URL" box. Note: When using EudoraMail, you MUST rename the image. Fill in the FTP server your're uploading to. depending on where your web page is at. 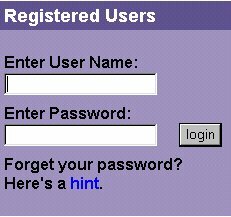 Put in your web page's, "User Name" and "Password". Scroll Down And Hit The "Transload" Button. to the files of your web page. The directions above can be used to upload Webtv Plus Email Sound Wav Files, The concept is the same. Note: To get the URL to the sound once it has been sent to EudoraMail. Follow The Steps Above. Play the sound, then click on the "GoTo" key on the keyboard, then in the GoTo Popup you will click on "Show Last". That will give you the URL for that sound. Take that URL with you to the Transloader. Also these directions can be used to transload photos or sounds that have been sent to you from a computer user.